In Gray Matter, I asked 'whose God is too small?' concerning all the loved ones I had lost to cancer. That question led me to speaking out against coal ash and fracking in Stokes County, NC. Because #BelewsCreekMatters. I combine formed paper, found materials, and written biographical stories to create sculptural books, which focus on my family, personal history, and spirituality. Okay, I love alliteration. 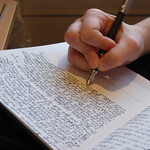 I write a lot. Every day. Way more than I create art. 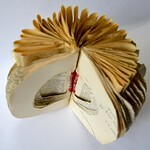 My writing informs my work and is an integral part of my final pieces of my sculptural books. I believe play is important work. That also means fighting for a clean environment. 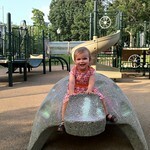 I speak up for playgrounds (very fun) and against coal ash (not so fun). Caroline can bring sacred ideas to life in her beautiful artistic expressions. As a pastor, my collaboration with Caroline deepened my congregation’s communal experience of worship and her art continues to inspire and deepen my own spiritual practice. Thank you for sharing your wonderful work with Nelson and me. Your books tell such powerful stories! I am enriched a thousand, thousand fold.